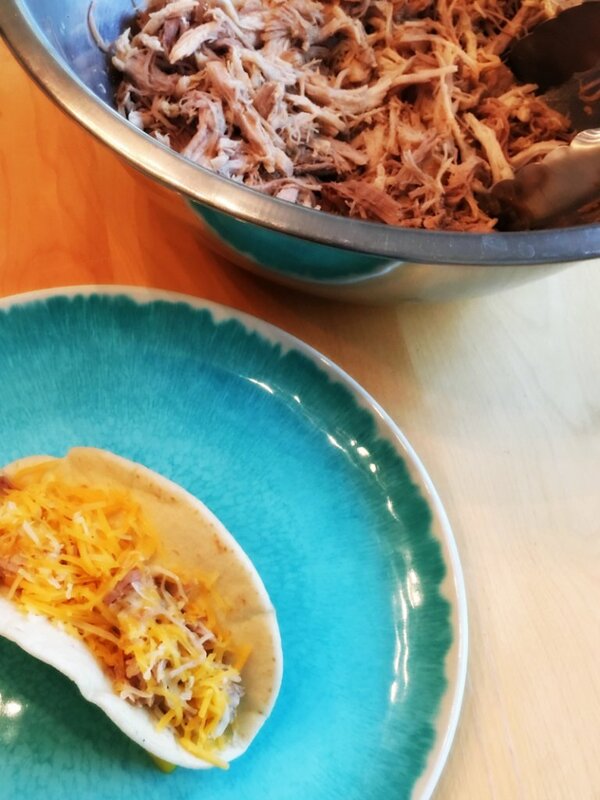 In honour of Amazon Prime Day, I thought I’d share my favourite recipe with my favourite purchase from last year’s Prime Day: Instant Pot Pulled Pork! This fast and easy Instant Pot pulled pork recipe is full of flavour! It’s cheap and feeds my family of five at least two meals. It’s fast for days when I don’t have my act together to start the crock pot in the morning. I have a major picky eater in the house and she will eat it. Shortly after I got my Instant Pot, I hosted an evacuated family after Hurricane Harvey for several weeks. I needed cheap, fast, easy and delicious meals to nurture everyone during that stressful aftermath, and that’s when I really fell in love with this recipe. I’ve made it several times since then. Let’s get started! I have made this recipe with a variety of pork cuts – basically anything big enough to be shredded after cooking – including pork loin and pork roast. I do recommend a boneless cut just so you don’t have to content with the bone. 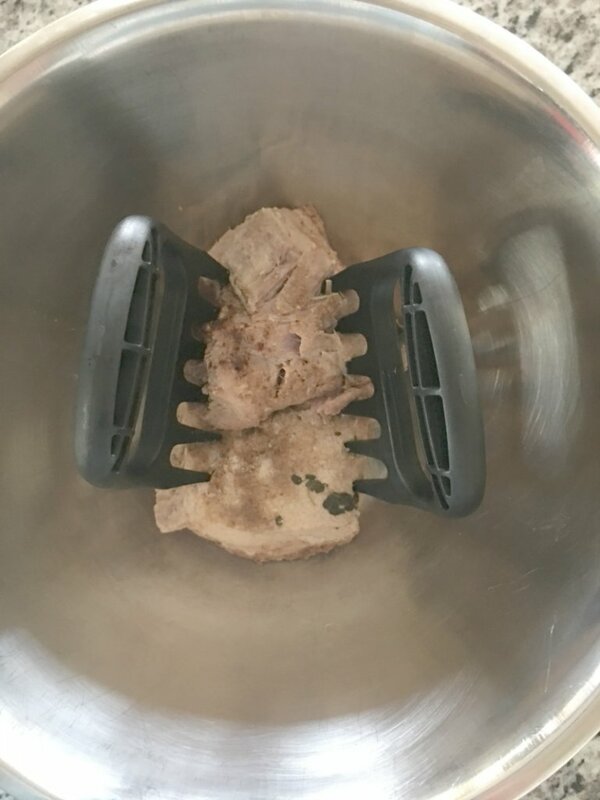 This time, I used a 3lb boneless pork loin that was on sale – it’s a good idea to watch for sales, buy extra and freeze them for when you have a hankering! How much liquid do you need in the Instant Pot for pulled pork? 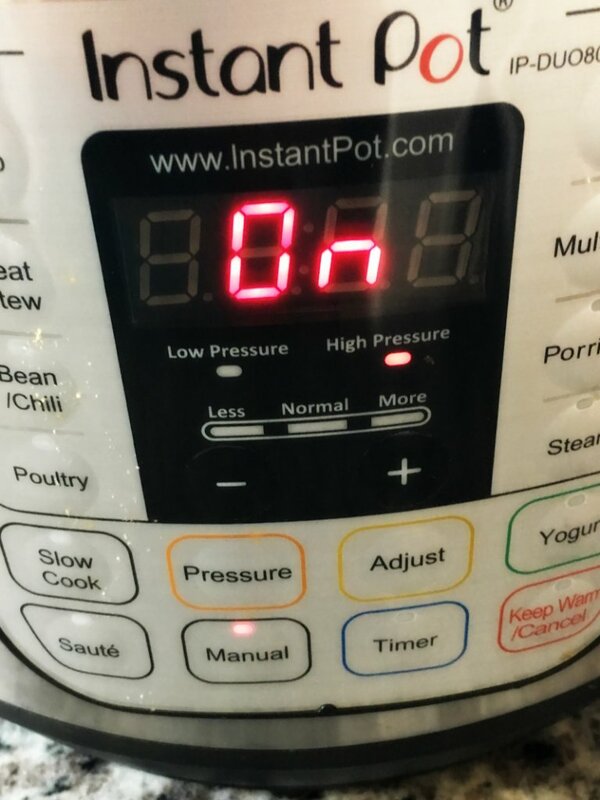 The Instant Pot needs less water than a crock pot. There’s probably a good scientific explanation for that but I am not here for science! 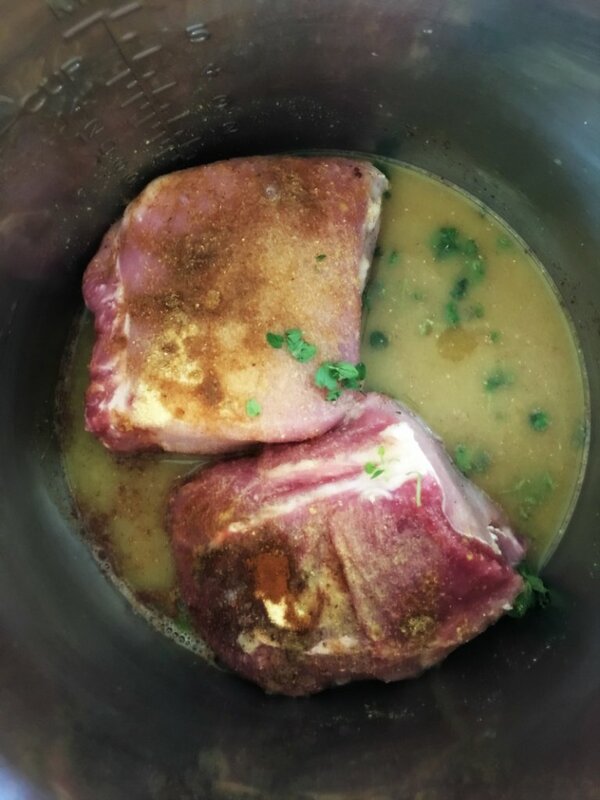 (though I do in fact have a science degree, that’s besides the point) In this recipe, I use one cup of strong chicken broth and there is plenty left over at the end and the pork is tender and moist. Let me show you how it’s done! This isn’t a fancy recipe where you saute the meat first on the saute setting and then set the pressure. No, this is a straight-up-Paula-Abdul-style recipe where you put things in the pot and then turn it on. That’s it. Here is my 3lb boneless pork loin cut in half to fit, my one cup of strong broth and the other spices you’ll see in the recipe below. After you put the ingredients in your Instant Pot and plug it in, ensure that the valve is closed. At this point, the red thing (I don’t know what it’s called) will be down. 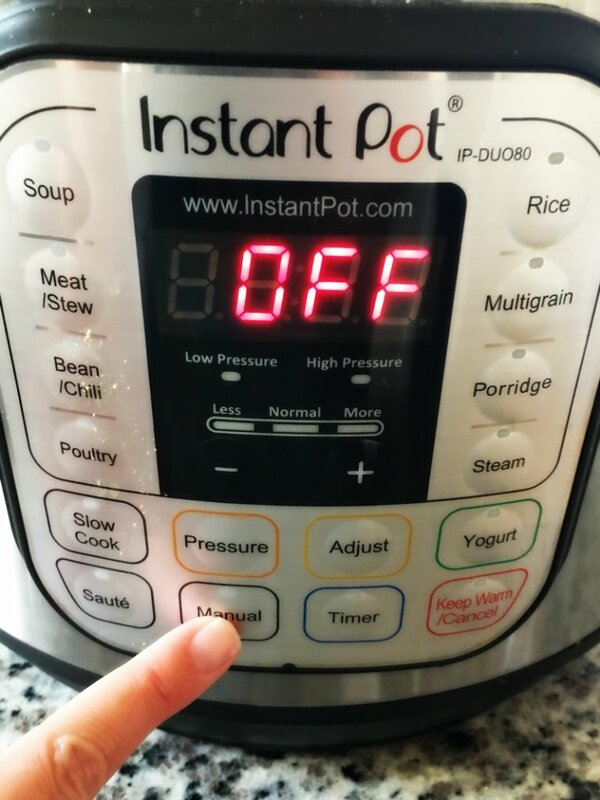 After you plug it in, the Instant Pot will read “off. Press “manual” then press the + button until the screen reads 60. This is what it looks like when you’ve done that. The “manual” and “keep warm” lights will be on. You don’t have to push anything else. It will start pressurizing in a few moments. It will read “On” while it’s pressurizing. While pressurizing, your might see or hear some steam coming out the vent. I timed it and it took 10 minutes for it to come to high pressure, for the steam to stop, and for the red thing to pop up. 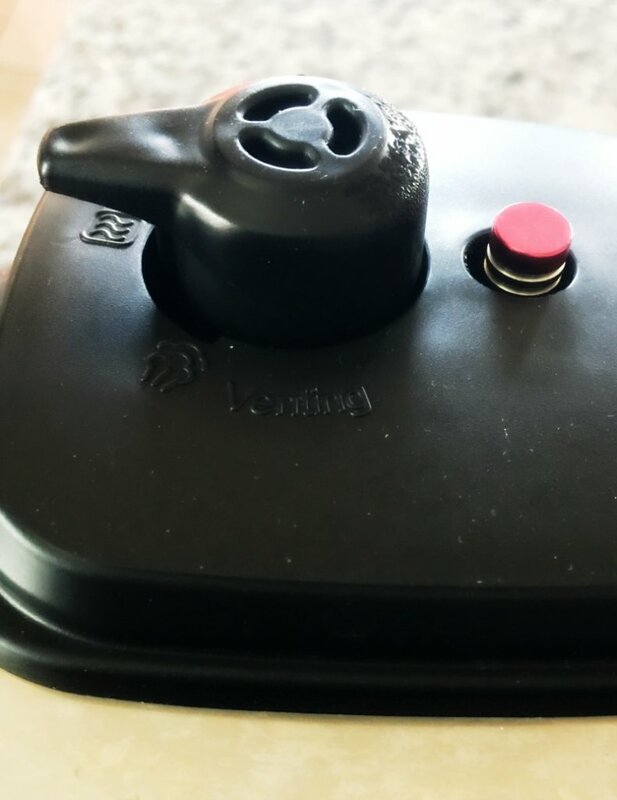 You can let it do a natural release which will take about 10-15 minutes for the pressure to go down, the red thing to go down, and the lid to release. 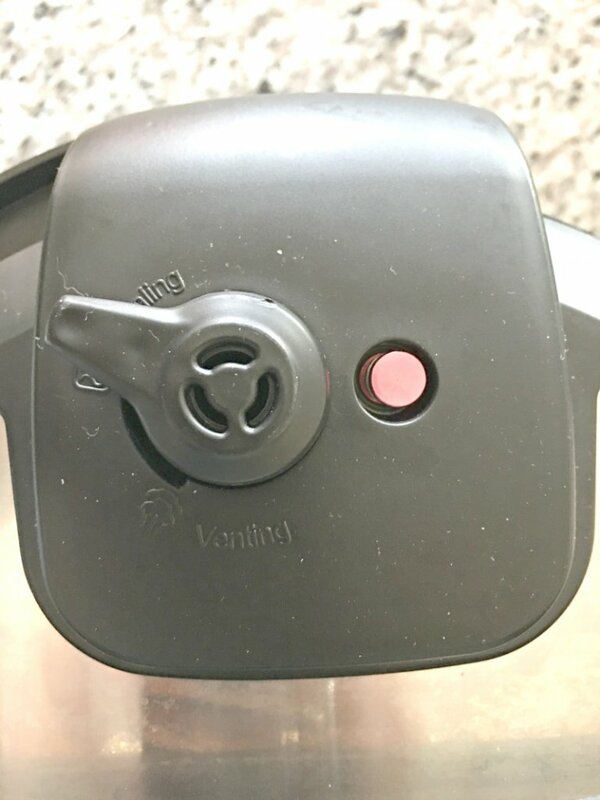 You can open the valve to the venting position and do a ‘fast release.’ IF you do this, ensure you keep your fingers out of the way because the steam will burst out and startle you, but hopefully not burn you. Either way, you will NOT be able to open the lid until the pressure is down and when you do, it makes an R2D2 sound that is very satisfying! You can shred your pork right in the Instant Pot but I prefer to move it to a large bowl. I also got these meat claws from Amazon because I make Pulled Pork so often and got tired of using forks. Et voila! The Pulled Pork is ready to go! 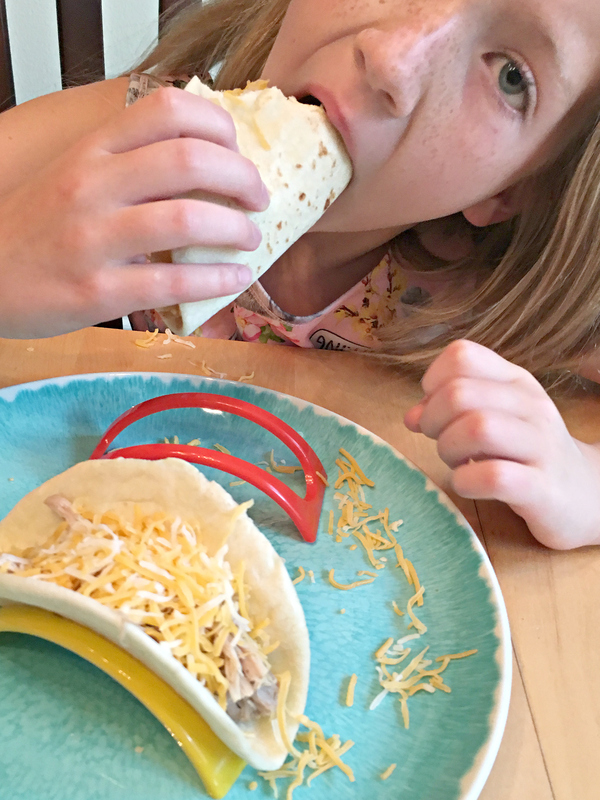 I have all the pork taco fixings on the table – cheese, salsa, guacamole, peppers, sour cream, cilantro – but my dear daughter likes her pulled pork taco pure with only cheese and meat. WINNING AT LIFE is how I feel when she eagerly eats anything! Yay Instant Pot Pulled Pork! By the way, I also got the taco holders from Amazon – a set of 12 because my family is so very precious that they can’t cope with their tacos falling open all willy-nilly. AND lo and behold, you should have enough Pulled Pork left for baked nachos the next day! Layer chips, cheese, meat, green onions, peppers, and jalapenos as per your preferences. The presence of the onions was enough to make this inedible for my daughter. Anyone want an 8-year-old? 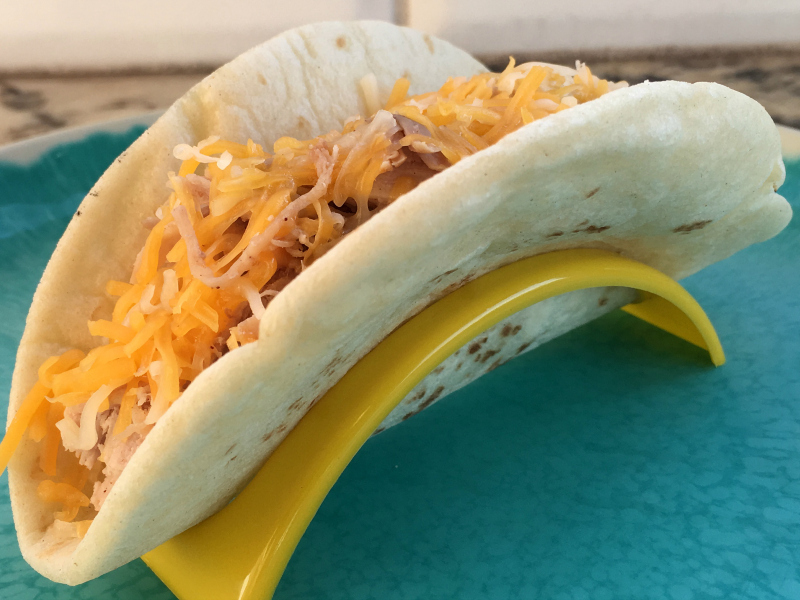 I hope you find this recipe as easy and tasty as I do, and find the Instant Pot directions easy to follow. Give it a try and let me know what you think! 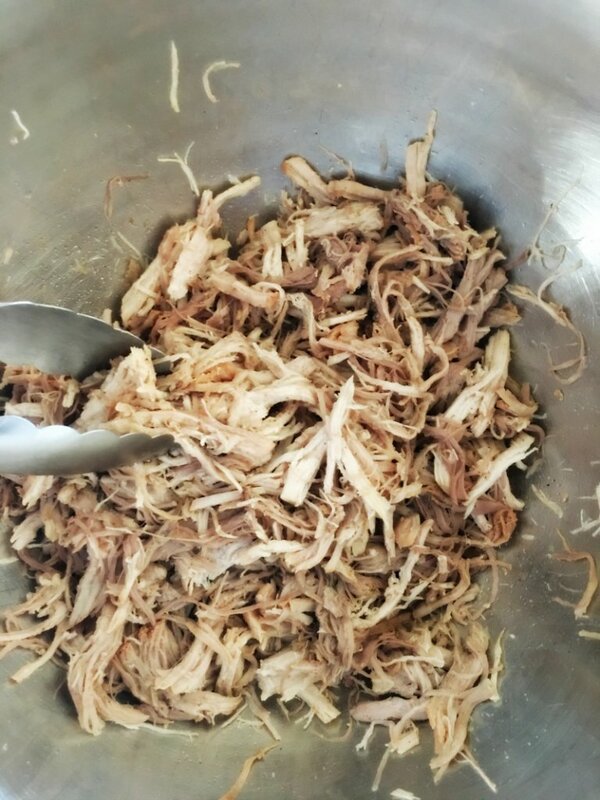 This pulled pork recipe is fast and easy to make, uses simple seasoning and tastes so good that even your picky eater will like it! Plus, it's cheap and will feed your family for at least two meals! *I use a condensed version for the broth and add 2 tsp to one cup of boiling water to get strong flavour. Because the broth has plenty of salt, I don't add additional salt. Put all ingredients in your Instant Pot. Ensure valve is closed. Push "Manual", high pressure, and press + till the display shows 60 minutes. 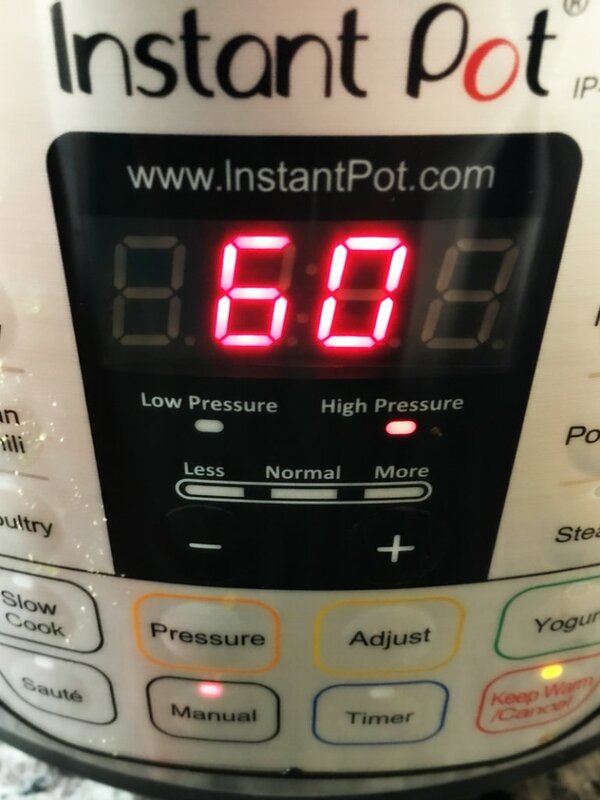 After approximately 10 minutes, the Instant Pot should reach full pressure, the red button will pop up, and it will begin counting down from 60. Go have a glass of wine while you wait. Don't do laundry, do something for YOU. After 60 minutes when the timer beeps, Choose either natural release or quick release by opening the valve. Transfer meat and some liquid to a bowl and use forks or meat claws to shred pork. You can reserve the broth for another recipe or discard it. 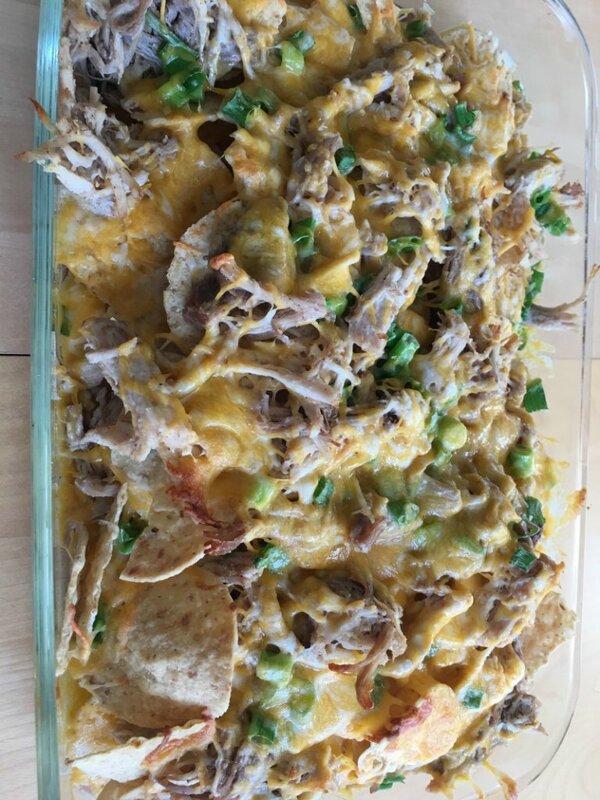 Serve pulled pork with tortillas and all the fixings or use it to make Pulled Pork nachos! Look smug while your picky eater gobbles it up. I just ordered an Instant Pot on Amazon – had to stalk the website all day because of all the glitches. I am excited to try this recipe. Thank you for the timely posting! Please keep more Instant Pot recipes coming. Really enjoying your new website and expanded topics though the thrift ones are still my favorite! That’s awesome! You can do so much with it! It does take a bit to get used to using it but this recipe is really straight forward! I hope you enjoy! Will do more for sure – stay tuned! I make pulled pork in the Instant Pot also. Its delicious. After it cooks in the Instant Pot, I spread the pork on a cookie sheet and pour a little of the liquid on top. Then I broil it for a few minutes. It makes the edges crispy crunchy. We always eat it all. YES! That is a great tip – so delicious! So long as you don’t have an 8-year-old who can’t tolerate “cooking marks”. :/ We often do that with leftover smoked brisket too. So good! Thanks for commenting and glad you love your Instant Pot as much as I do!